A warm spring welcome to Honeycomb Dental Clinics’ second edition newsletter. As we approach sunnier days and spring flower bloom, a lot has been happening behind the scenes at Honeycomb HQ, we thought you might like to know what we have been up to since Christmas. A memory of Christmas past. A distant memory for most of us but we had a lovely festive period in the Clinic. Patient numbers were at an all-time high; with a strong progressive increase since last year. Our dedicated ‘Honeycomb Hive’ have been very ‘busy bees’, working hard to continue to provide high standard customer service and dental care to all our longstanding loyal and newly registered patients walking through the clinic door. Our team enjoyed a Christmas get together at Rookery Manor to celebrate an end to a busy 2018. Experiencing a night of ‘Rat-pack’ entertainment, a traditional festive meal and night of dancing. Good fun was had by all. 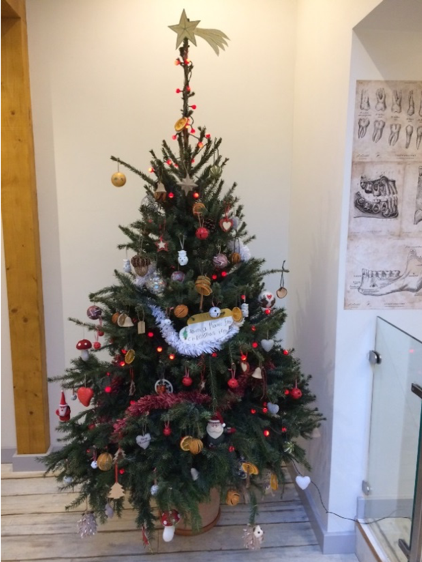 If visiting the premises over the festive period, you may have seen our ‘Plastic Free’ living potted Christmas tree. Miguel, the owner of the clinic had fun with his daughter creating some plastic free homemade Christmas decorations to help festive cheer the patients lounge and reception area. We even managed to find recycled paper ‘tinsel’! Our living tree has been planted outside in the clinic back garden, we are hoping it will prosper there so it can be used again next Christmas. Replanting a potted tree saves cutting down multiple trees to be used solely for decoration or using an artificial one. We managed to buy our potted tree from the local Budgens garage in Langford at a very reasonable price; especially cost efficient if it lasts multiple years; Green fingers are crossed that it survives in our garden now! Team Honeycomb care about supporting our lovely local community, not only through providing families in and around the area with oral care services; we also try to use local resources and companies to assist in our business processes. We are proud to be the main sponsor this year of the local under 11’s football team in Winscombe. The Winscombe Warriors have been recently provided with a well-deserved fresh looking new kit for the players and coaches. The children were very happy to receive the swish new kit, they look the part now in addition to playing exceptionally well of late. Here is the clinic owner and provider, Miguel with the team, on the day the kit was issued to the Winscombe Warriors. The clinic provider has directly been involved in talks as a pioneer of Environmentally Sustainable initiatives within Dentistry. Sustainable responsibility and steps taken by Honeycomb Dental Clinic working in conjunction with the Centre for Sustainable Healthcare has propelled our clinic to be used as a case study. Miguel Colaço recently participated in a webinar for Dental Sustainability. It was aimed at Dental professionals and other providers in Dentistry to attend. If you would like to hear the webinar; it was recorded and the webinar link is: https://sustainablehealthcare.org.uk/resources/sustainable-dentistry-guide/sustainable-dentistry-how-guide-webinars . In the meantime, we are still the only clinic in the UK with ‘Gold’ status accreditation by GreenAchiever.co.uk for our ‘green efforts’ to be as environmentally responsible and sustainable as our industry permits. We make strong effort to commit to being as ‘Green’ as possible. Every action of each person counts now, more than ever. Businesses must take responsibility of their impact on our planet also. If you would like to learn more about what we are doing to try and be more sustainable, please look on our website under ‘Our Green Ethos’ menu at the top of the website. Our Environmental policy can also be found from these pages. Movers and Shakers. We are Hiring! We are on the look out to recruit an experienced dental nurse. The position is to join our busy, friendly, thriving ‘hive’. A full-time permanent vacancy of 36hrs weekly, to worked over 4 days. We provide competitive rates and a chance to become part of a close, dedicated and wonderful team. If you or anyone you know might be interested in the role, please contact our Practice Manager, Tina Thompson via the job advertisement placed on Indeed website. Since expanding our facilities and capacity we welcome more great people aboard, ‘swarming’ to our ‘hive’. We have multiple new recruits that have joined recently and extend a huge warm welcome our new receptionist Jayne who is assisting our team and patients. Jayne is an experienced dental receptionist who is keen to serve our staff and patients to the highest customer service standards. Rowena is our new full-time trainee dental nurse and we are excited to support Rowena’s journey into dental nursing. Exciting times are ahead for all. Please help us welcome our new ‘buzzy’ team players at your next appointment to the Clinic. We welcome Dr. Eurico Germano who is joining the team and bringing Implantology to the Clinic. If you think you can be a candidate for dental implants or have thought about it in the past; now may be the time to call our front desk and book a free assessment to find out your personal possible options. Why not? Decay is prevented by effective and regular plaque removal by toothbrushing, having a controlled diet, using the correct amount of fluoride in toothpaste, and regular dental visits. Both children and adults need to brush their teeth twice a day for at least 2 minutes. Just before going to bed is the most important time, the other occasion can be at any point during the day but ideally in the morning. Children up to the age of at least 7 years old should be supervised when brushing their teeth to ensure an effective technique, consider continuing this at a later age if needed. Always ensure supervision and help with brushing before bedtime to ensure effective plaque removal is carried out at this important time. Brush your child’s teeth with toothpaste containing the correct amount of fluoride (see below for details on this). After brushing, encourage your child to spit the excess toothpaste out but not to rinse with water or mouthwash. This will enable the fluoride in the toothpaste residue to last in the mouth for longer, to help reduce the risk of decay. No food or drink (other than water) to be taken to bed. Children below the age of 3 need at least 1000ppm fluoride contained in their toothpaste (look at the toothpaste ingredients to check this). Children aged 3-6 need 1000-1350ppm fluoride contained in their toothpaste. If your child has a history of decay or a higher risk of decay developing, then from age 0-6 they should use toothpaste containing 1350-1500ppm (check with your dentist or hygienist if you are unsure of this). Only a smear of toothpaste is needed below the age of 3, and a small pea sized amount for age 3-6. All children above the age of 6 (and adults) should use toothpaste containing 1350-1500ppm fluoride. Wait for at least 30 minutes after eating or drinking (other than water) before brushing your child’s teeth (this is also relevant for adults). is particularly the case for more acidic or sugary foods/drink, or stickier foods that hang around in our mouths for longer. It will ensure there is no excessive food debris present while brushing, and ensure we have a non-acidic environment present while brushing to help protect our enamel. than these 5 times, then your teeth are more at risk of developing decay. It isn’t the amount but the frequency of food/drink that needs to be limited when preventing decay. Tea and coffee (or plain milk) without sugar, is relatively safe for our teeth if drunk in moderation. Some foods/drink pose a greater risk of causing decay that others. These include foods/drink containing sugar, and processed foods that hang around in our mouths for longer; it takes our saliva more time to clear and cleanse them away. Fresh, non-processed foods are the best choices for our teeth and general health. Do however be wary of fresh acidic foods (i.e fruit); they typically have a lower risk of developing decay but a higher risk of causing tooth wear when consumed frequently. In the past 6 months we have seen a sharp increase in patients registering with us as Denplan members. Our Denplan numbers are consistently increasing month-on-month. This can only be a sign of a good option for patients’ oral health. Dental treatment can be fully included with a payment plan, or can be discounted (depending on your plan option). Amongst many other benefits, Denplan gives patients access to 24hr emergency dental care, dental travel insurance, members gain access to earlier and later appointment slots at Honeycomb DC, plus inclusive hygienist appointments. Our monthly payment options are some of the lowest within the South West. Please enquire with our Front-Desk team for more details about this UK-wide preferred scheme. Dental Curiosities / Did you know? Our new patients lounge has a dental curiosities museum area, this has prompted a ‘Did you know’ segment in our newsletters relating to interesting facts and curios regarding dentistry, techniques and people. So… Did you know? Our museum corner shows antique pieces such as the ‘hanging tooth’, made in the late c1800’s to advertise the fact of possible tooth extraction assisted by gas anaesthesia. (back in the day, not here at Honeycomb!). The first recorded dentist comes from around 2660 BC and is named Hesyre (also called Hesy-Ra). He was chief of dentists and the chief physician to the Pharaoh Djoser. At this time, most dental work consisted of shoving things into the decayed, chipped, or broken tooth, gum area, or abscess in the hope of easing pain. These items ranged from honey to herbs and plants, to possibly even gold. It is uncertain if dental procedures using gold as a filling material took place post-mortem. Nonetheless, it’s very safe to say that any procedures performed in these times were excruciatingly painful! A hop and a skip out of March…. We hope by now most of our patients have seen the new look and feel of the Clinic. We are striving to bring even better services to all our loyal and newly registered valued patients. Please let us know what you think about our facilities and services. We very much appreciate the positive comments some of you have left for us on the NHS Choices website, Facebook page and Google. We look forward to seeing you at your next appointment at the clinic. Until then, please keep brushing and smiling!